What would you pay for a pet puppy from a breeder? shows but pups that cannot be shown. to show, test and vet bills. I know for me personally. When I decide to get another GSD, I will go to a breeder simply because of all the problems I had with Navarre. Not that going with a breeder is a gaurantee of anything. I can say that my next dog will be a rescue, as Daphne was. And who knows, maybe I will get another GSD as a rescue too, I just know that at the moment I would feel more secure going with a breeder. Why others do it, I have no idea. Some people just like to say that they have a "purebreed" that they got from a breeder. I know what you're saying, but the breeders are offering security, like Navarre said. My puppy (coming home Nov 19!) is a "pet" puppy from a breeder. I don't know if show dogs must be intact (not spayed/neutered), but it sounds to me like I'm paying a lower price for a "pet" puppy because I'm promising to have him neutered. Most prices I've seen for purebreds range between $800 and $1200. I'm sure it depends a lot on what breed you're looking for too. We wanted a new puppy because we thought it would be easier to raise. Rescues can come wth emotional issues that aren't apparent right off. I know that a new puppy could have issues, but we thought it would be somewhat easier. Plus, we loved the breed and it characteristic s.
We do, however, want to rescue when the time is right for an addition to our family. We went to the shelter on Saturday and saw so many beautiful dogs that need homes, so we know rescuing needs to happen. Plus rescues come to you with all the shots and fixed so you save a lot of money. About the price...the funny thing was we found puppies for half of what we paid for Lucah, but for some reason we just didn't feel like those dogs would be a good fit for us. But the day we met Lucah we knew he was coming home with us. Lucah's breeder didn't have a pet vs. show price. She felt that all her puppies could have been shown and did an average price for all of them. Basically we paid towards the top of the scale for Lucah...but he was worth it. Zoey and Dolly, which I'm pretty sure both came from byb, were both for less than $200. Dirt cheap for a Giant breed dog. Good thing too. That's all I could afford. All of my dogs had always been rescues. Several years ago, my last one had passed, and I was so broken hearted, I decided not to get another dog. So, several years went by, and I finally felt ready for a dog, and did the research, etc. to see what breed fit our needs, and set out looking for rescues. 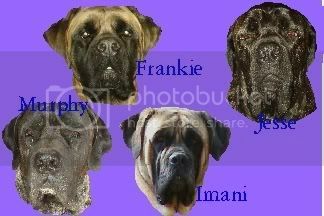 Unfortunately, there were no rescue mastiffs available in my area. We would have had to travel several hundred miles, pay an adoption fee of $800 plus, and still have to wait til one came along that the rescue felt fit our needs. So I did the next best thing... I started researching breeders who were involved in rescue. I found one not far from us, and sent off an email asking for a rescue or special needs dog, and she eventually decided we were just what she was looking for to raise and love one of her 'breeder contract' girls. We brought home Imani in December of 04. After having her for almost a year, she emailed asking me to take a nine week old female on a breeder contract as well. Since then, more rescue mastiffs have shown up in our area and in areas we were willing to drive to, and we are involved in breed rescue. We adopted Jesse, and fostered Maggie, who was placed this past August. This breeder's standard puppy price is $2500, of course all are tested and shown to championships before being considered for breeding. Since then, Frankie has been rejected from the breeding program and has been spayed. My fiance and I are on a waiting list for a Newfie. The breeder we're going through has the same price for all her puppies, just a different contract. They charge $1500 per pup. All the breeders a talked to charged either $1500 for their pups regardless of show or pet quality or with some breeders they charged $2000 for their show pups (and $1500 for pet).